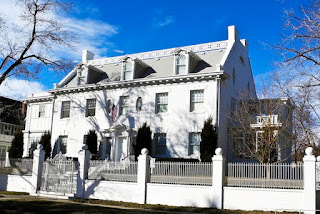 I have long been intrigued by the big white house on the north west corner of 7th Avenue & Ogden Street. For the longest time I thought it was an old tuberculosis sanitarium, later I errantly concluded it must be the Germain Consulate. This week I learned the true identity and history behind that mysterious big white house. Twenty Six year old Alfred Cass married Mary Ashton in 1876. They spent time in Nebraska before relocating to Denver in 1888. Alfred quickly rose to prominence in the Colorado Fuel & Iron Co. The widow Mary Cass built the large Colonial Revival house in 1908, five years after her husband died. She died shortly after the house was completed. It may not be fair to label the second owner of the house, oil tycoon Henry Blackmer, a miscreant. It was never proven he was smuggling bootleg liquor, but Blackmer didn't always conduct business on the up-and-up either. He fled the country in 1924 leaving his son Myron in charge of the house. The Teapot Dome oil field in wyoming is a mere 60 miles from my home town. Teapot Dome and several other oil fields formed the U.S. Navy's oil reserves. In 1921 President Warren Harding transfered control of some of the reserves, including the Teapot Dome field, to the Department of Interior under Secretary Albert Fall. Secretary Albert B. Fall truly was a miscreant. He had ties to vote fixing, cattle rustling, and murder for hire. In 1922 Fall quietly gave drilling rights for parts of the reserve to Mammoth Oil Corporation and the Pan-American Petroleum & Transport Company. This shady transaction would bloom into the Teapot Dome scandal and ultimately resulted in Fall's imprisonment in 1929. Henry Blackmer held an interest in the Continental Trading Company which was to receive large sums of money from the oilmen involved in the Teapot Dome scandal. He fled to France when he was subpoenaed to testify and didn't return for 25 years. At the age of 80 and in poor health, he was fined $20,000 in 1949 for contempt of court. Sometime between 1925 & 1949 the house was converted into apartments, but for the past 62 years the big white house has belonged to the Saint Germain Foundation. Many consider the St. Germain Foundation to be a cult. As symbolic of their "I AM" activity the cult painted the red brick building all white. Thus ends the mystery of the the big white house on 7th Avenue. Ferril, Will C., ed. Sketches of Colorado. Vol. 1. Denver: The Western Press Bureau Company, 1911. Keezer, Dexter M. "Blackmer Will Dodge Oil Trial." Pittsburgh Press, 12 Oct. 1927, Two. Leonard, Stephen J. and Thomas J. Noel. Denver Mining Camp To Metropolis. Niwot: University Press of Colorado, 1990. "Teapot Dome Figure Fined." Milwaukee Journal, 2 Nov. 1949, M2. Widmann, Nancy L. The East 7th Avenue Historic District. Denver: Historic Denver Inc., 1997. Wikipedia contributors, "Albert B. Fall," Wikipedia, The Free Encyclopedia, http://en.wikipedia.org/wiki/Albert_Fall (accessed February 22, 2012). Wikipedia contributors, "Saint Germain Foundation," Wikipedia, The Free Encyclopedia, http://en.wikipedia.org/wiki/Saint_Germain_Foundation (accessed February 22, 2012). Wikipedia contributors, "Teapot Dome scandal," Wikipedia, The Free Encyclopedia, http://en.wikipedia.org/wiki/Teapot_Dome_scandal (accessed February 22, 2012).